One of the world's most spectacular automobile museums is located directly next to the headquarters of Porsche AG. 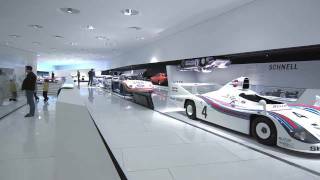 The Porsche Museum. “Those who have the good fortune to turn their dream into a business owe it to the world to be the custodians of such dreams.” This remark by Dr. Ing. h.c. Ferdinand Porsche could be considered the very cornerstone – at least in spirit – of the Porsche Museum. His dream did become reality. The 5,600 square metres of exhibition space in the futuristic museum building created by Viennese architect Delugan Meissl accommodate over 80 vehicles – from the first Porsche designs in the world to the latest generation of the Porsche 911. In the first year after it first opened on January 31, 2009 the Porsche Museum vividly evoked the appeal and diversity of the Porsche brand to over 700,000 visitors from all over the world. By December 2013, the Porsche Museum had welcomed two million visitors through its doors. It serves as a meeting point for international customers as well as many others from all over the world who are fascinated by Porsche sports cars, even if they do not drive a Porsche themselves. While the bold architecture of the building reflects Porsche’s distinctiveness, confidence and heritage, the exhibition keeps the history of the company every inch alive, with all the sports cars in the “Museum on Wheels” fully functional and capable of springing into life. That makes the museum suitable not just as an exhibition space, but also as a platform for communication – a core component of the regular dialog that Porsche maintains with the general public. Unlike other automotive museums, the Porsche Museum consciously rejects the “discovery zone” approach. At the Porsche Museum, the vehicles should be able to speak for themselves; the thematic thread is provided by the exhibits themselves, and not by any external prompts telling the visitor what they should think or feel. The museum furthermore embraces an educational mission to fulfil a trendsetting cultural function at the traditional Zuffenhausen location. Using state-of-the-art museum techniques, the exhibition conveys a wealth of historical and contemporary knowledge about the Porsche company. Depending on their individual interests, visitors can approach the exhibits and the company’s history from a variety of perspectives. Porsche deliberately avoids marketing-led declarations in its communication with visitors, instead placing the emphasis on its cultural mission to educate. The interior of the Porsche-Museum. In keeping with its pre-eminent position within the German automotive industry, Porsche uses the museum as a platform for informing national and international visitors about the history and achievements of the German automotive industry. Alongside its thematic direction, the most notable attribute of the exhibition concept is its flexibility, as befits the Porsche brand. All vehicle exhibits are “mobile” in a very real sense. In other words, the exhibition itself and all the media installations can easily be reconfigured and the exhibits changed, to maintain a high level of variety and appeal. A chronological tour presents the history of motorsport and series vehicles of the company. As well as the exhibition, the Historical Archive and the glass-fronted workshop for classic vehicles, the museum’s predominantly white interior houses a diverse range of eating and drinking establishments – Coffee Bar, Bistro and gastronomic restaurant – as well as large-capacity conference areas. The Porsche Museum can also be used as an event venue for conferences, film screenings and concerts, for example, without intruding on the main exhibition. The museum at Porscheplatz enjoys an auspicious place in German automotive history. This was where the former Porsche engineering office relocated, from Stuttgart city centre to Zuffenhausen Plant 1, as long ago as 1938. In that same year this was the birthplace of the model that ultimately evolved into the VW Beetle, followed in 1939 by the Type 64, the forerunner of all Porsche sports cars that was known as the “Berlin-Rome Car”. Sports cars sporting the world-famous Porsche crest have been built at Zuffenhausen since 1950. 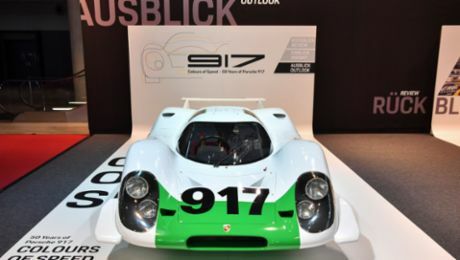 One of the strongest number sequences is celebrating its 50th anniversary this year: the Porsche 917. 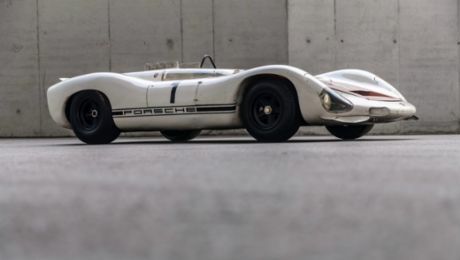 The Porsche Museum is taking the first Porsche 917 and the lightweight 910/8 Bergspyder to the Stuttgart Messe. Portrait about the Porsche headquarter in Zuffenhausen - the centre of the Porsche world.